Review: McDonald's Twister Fries is back! After a humid day at the church, Bochok (Cho-u) and I thought of staying home due to the threat of Typhoon Juan (Megi) to hit the country today. And what better way to enjoy watching movies at home but with a great lunch delivered from http://www.mcdelivery.com.ph. I remembered having McDo's Twisted Fries back in college at McDonald's Philcoa when it was quite a hurdle of expressions to explain to my Korean students in UPDiliman why it was called Twister Fries. The memory brought me back to how McDonald's Philcoa had become a "tutor tambayan" of Pinoys and Koreans for meet-ups and informal classes. Nibbling at every bite of each twisted fries was a reflection of all those experiences back in college until I saw my son grab mine and finish it in less than a minute. My whole reminiscing got twisted to the reality that he is the present memoir of all what is now about me. That twisted thoughts of his on how potatoes are shaped as twisted fries brought me back to reality. It was a great Sunday McDonald's lunch. Double Cheeseburger with new Sprite Regular Green Fizz McFloat (P148) , Twisted Fries Ala Carte (P58) and Big Mac with Twisted Fries and regular Coke (P162) made our Sunday lunch truly one family bonding moment. 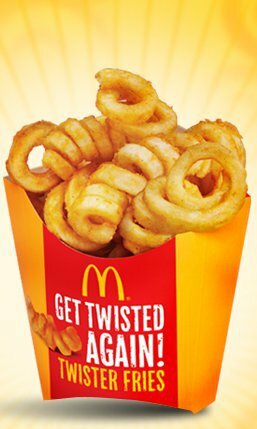 McDonald's Twister Fries 17 years ago looked and tasted the same as the new McDonald's Twister Fries now except that the packaging was different and the price too at P58 (online). My twisted thoughts, well, have long been a habit since I'm a twisted person but let's not twist the purpose which is to document simply every activity for me to reminisce and check back in the future. Oh, and no more delivery charges!